December is right around the corner. Tomorrow I'm wrapping the chocolates for our advent calendars - a whole bunch of selectors from Hotel Chocolat - I've already been out to Whitehall garden centre and dribbled over all the decorations and met a few reindeer, and I've got plans this week for a historical day out with my lovely Lucy and some mince pies. My Christmas shopping is just about done, and my thoughts are turning at last to the more frivolous side of Christmas. I even have my eye on a gorgeous green dress. 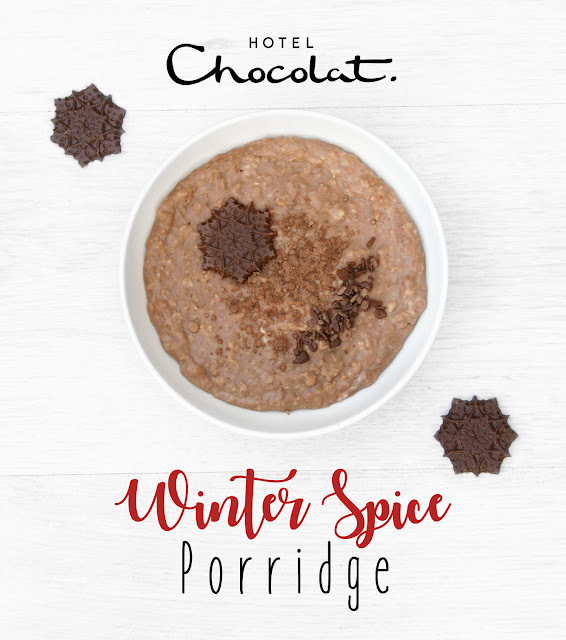 But I've given myself permission to get festive a little early, and along with making some skinny Christmas favourites, I also couldn't resist using Hotel Chocolat's winter spice hot chocolate I told you all about last week in a porridge. 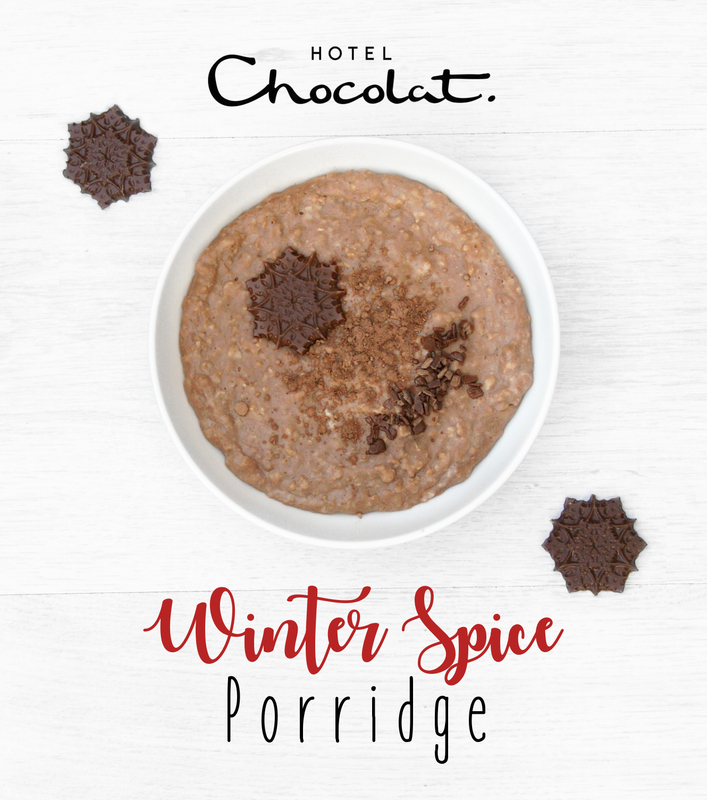 After all, all that really separates a hot chocolate from hot porridge is oats! I didn't use a full 35g serving of the chocolate flakes because, y'know, it's breakfast, but the 20g I used turned out to be more than enough. I could have gotten away with less - in fact, if I make it again, I'll just use 15g and that'll re-balance the servings in the tub. Maths. But the spices of the hot chocolate shavings still come through really well, and are more subtle than when made as a beverage. The porridge is quite simple, as they always are, and the flavour and sweetness all comes entirely from the chocolate. No need for honey or stevia here! And if you're wondering if it's going to be sickly sweet, it isn't. 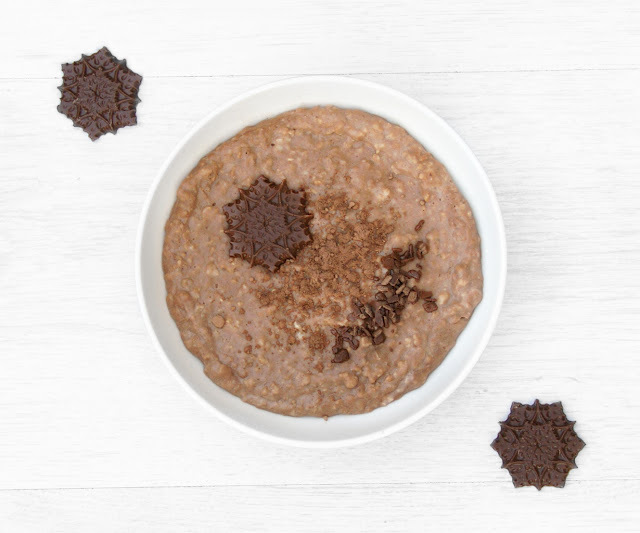 The tiny chocolate snowflake I added on top was close, but it also served to point out how breakfast-appropriate the sweetness of the porridge itself is. I garnished it with 1 snowflake from a Hotel Chocolat tree decoration, which contains 3 at 20 cals a piece, and a sprinkling of Aduna cacao powder and some chocolate shavings. Because Christmas and chocolate. 1. Combine oats and protein in a pan and mix thoroughly. Add the freshly boiled water and the milk and stir over a medium heat. 2. Bring to the boil then reduce to a simmer for 5 minutes. 3. Stir in the Hotel Chocolat flakes until melted. • 20g of chocolate can be reduced to about 15g - if in doubt, start at 10g and add a little more to your own taste.